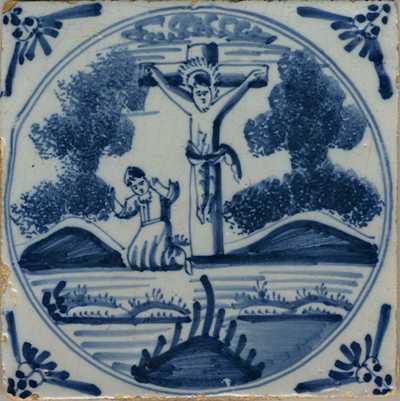 One of four Delft tiles from the Drayton Hall Collection that are on display at the DeWitt Wallace Decorative Arts Museum in the new exhibit, A Rich and Varied Culture: The Material World of the Early South. The four were chosen from a set of 48 tiles thought to be original fireplace tiles from one of the second floor bedrooms of Drayton Hall. The tiles are tin-glazed earthenware with hand-painted cobalt blue decoration of biblical motifs. This particular tile depicts the crucifixion of Christ. The tiles were most likely made in the Netherlands, c. 1730-1750. Gift of Mr. Charles H. Drayton, III and the late Mrs. Martha Drayton Mood. We want to hear from our readers! Are you planning on visiting Colonial Williamsburg in the near future? If so, we hope you will take time to see the 27 Drayton Hall objects on display at A Rich and Varied Culture: The Material World of the Early South.